Roslyn loves spending time with her cats outside, and has even taught a few to walk on a leash! Follow her advice and you can too! One of the big differences between cat people and dog people is that dog people get the experience of walking with their pet every day. Cat owners don’t get to take our cats to the park or sit outside with them at a pet-friendly restaurant. For cat people, the internet is our dog park, with all of its pictures of cute kittens. That’s why walking your cat on a leash might sound like a wonderful idea. You get to show off your gorgeous feline and enjoy bonding time with your pet; your cat gets to enjoy a little exercise in the great outdoors. What could be better? Training your cat to walk on a leash is not easy, but it can be done. I’ve taught two cats to walk on a leash. Skittles was young, so she learned pretty easily. She loved being outside so much that we graduated her to an electronic cat fence. The other cat, Bengali, was too nervous to enjoy his time outside, so we stopped taking walks together. Every cat is different, and not every cat enjoys walking on a leash, so keep that in mind going in. It takes patience and persistence, but letting your cat be a “wild thing” for a change can be fun for both of you. So are you two ready to start exploring the backyard together? Here are the 4 most important things to know before leash walking your cat. 1. Consider why you want your cat to walk on a leash. If you want to be able to take your cat to a park or walk around the block, keep in mind that not all cats will be able to do this. Your cat’s motivation is probably different from yours, and he may just want to chase butterflies for a few minutes or sunbathe for a few hours. Choosing the right harness and leash can make the difference in success and failure when walking your cat. 2. 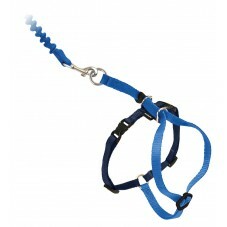 Buy the right kind of cat harness and leash. Most cats can slip out of traditional collars, so they need a special kind of harness and leash, like the Come With Me Kitty Harness & Bungee Leash. Cat harnesses sometimes come with instruction guides to help you get the most out of your training. You should also attach a special cat collar to your cat and an ID tag with your address and phone number in case she does slip out of the harness. 3. Start slowly and work your way up. Fit the harness on your cat and get her used to wearing it inside first. Next you can walk for short periods outside, staying close to the house at first and slowly moving farther away, until your cat is completely comfortable outside. Make it short, fun, and relaxed, and let your cat take the lead. 4. Pay attention to your cat. Your cat’s body language will tell you if she’s feeling stressed or scared. Look for signs like flat ears, body low to the ground, meowing, and nervous tail twitching. If you’re not sure, try petting your cat; if she’s stressed, she may avoid your touch or go rigid. Your reassuring pets will also help her relax. When you see signs of stress, try to figure out what’s making your cat nervous and move to a safer spot. Just take it slow and you'll be enjoying the outdoors with your kitty on a leash in no time! Have you ever walked your cat? Do you think your cat would like walking with you? Do Fireworks Make Your Pet Nervous?